Years ago, our family took a vacation to Palm Springs with a group of other families, all of whom had children about the same age. We were in a big resort with a number of swimming pools and tennis courts, we had bikes and scooters, and everyone brought a few board games. The idea was that the adults would rotate keeping an eye on the kids, creating lots of room for everyone else to enjoy more adult recreations. I played a round of golf, but my main "me time" motivation was to hike in the desert. I love few things more than awaking in the dark in order to get a cup of coffee and bit of breakfast in me in time to hit the desert in the cool morning, just as the sun begins to peek over the mountains. One morning I awoke extra early and drove over to the Joshua Tree National Park. I'm not going to try to describe this special place to you, but hiking among the Seuss-ian trees and unlikely rock formations opened me up to the universe to me, calming and exciting me in equal measure, taking my thoughts away from the petty concerns of day-to-day life. When I returned to our group, I pretty much single-handedly persuaded our entire group that they must go with me on the following day. The children were not exactly thrilled with this idea, especially my own daughter Josephine, then about six-years-old, who simply could not understand why she should be expected to leave this her Spring Break paradise for "a desert." As we drove through the park looking for a place for our group picnic, she griped, "What's so great about this place?" Then sarcastically, "Oh look, there's a tree. And another tree. And a rock. And a rock . . ."
People often praise me for my patience, but this was one of those times when I was approaching the end of it. The kids piled out of the cars shouting, complaining, and fighting, our late-ish start meaning we'd arrived as the heat was mounting. No one was anywhere near reveling in the mystical wonder of it all. We found a patch of shade with picnic tables and while the others began to set things up, I took my girl by the hand, a little testy, and said, "Let's go for a walk." We followed a barely there trail around the corner of the abrupt rock formation against which they'd built the parking lot and suddenly we were alone in this magnificent place. We walked in silence for a few hundred yards. Tension ebbed away as we became two people, both now alone with the person with whom we had spent most of our waking hours during the past six years. When Josephine finally spoke, she asked as if continuing a conversation, "Do you ever think that maybe we're just tiny specks?" I said I had thought about that. "Maybe there are giants and we're so small they can't even see us." I told her about the "Bowl of Soup" theory: the idea that our entire universe is just an atom at the bottom of a bowl of soup in another, larger, universe. "Maybe the giants will eat us." She wasn't bothered by this idea. In fact, she smiled as she said it, the way one does at a bright idea. I said that our whole universe might be born, live, and die long before the giant even came close to getting to the bottom of his bowl, let alone getting it into his mouth. She thought about this and nodded. We walked some more in silence. We had been following the base of the rock formation a track that was leading us back around toward our friends. I've always enjoyed what I call, "scrambling," which is to sort of clamber up and down rocks. I jumped on top a boulder, bounded to a larger one, then stair stepped down the other side. Josephine had never been a climber, but she followed me and we scrambled our way back to our friends. My formal study of philosophy is limited: most of what I know of it comes from what I've gleaned through secondary sources like novels and biographies. This does not mean that my philosophy is not profoundly meaningful to my own life: it is, just as yours is to you, and just as our children's is to them. Don't doubt that children have a philosophical life just because they're little. 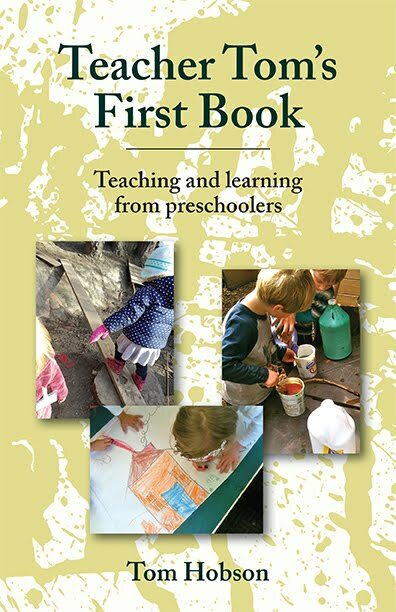 Indeed, most early learning is of the philosophical sort: we have experiences and we try to make sense of them, attempting to fit them together in a reasonable and systemic way, to create and test theories about the big questions. When my brother-in-law died when Josephine was two, she asked, "What happens when people die?" I told her that some people believe in heaven, then sketched it out a little for her. She said, "Uncle Chris is in heaven drinking coffee, playing his guitar and playing basketball . . . And getting it ready for us." A couple years later she announced from her car seat over my right shoulder, "I don't believe in heaven any more." I said that some people don't. "I think you come back alive as your favorite animal. I'm going to be a bunny, because that's my favorite animal." It's tempting to answer children's philosophical questions with certainty, to let them know it's all taken care of, when that's by no means the case. We have the same open questions we've always had about the nature of existence, of reality, of logic, of values and morality, of war and peace and life and death. Oh sure, some of us have it figured out, and I don't mean that sarcastically. I know many people who are quite certain about their own philosophies, and I don't for a moment doubt them, even when I think they're wrong. One could even argue that all of us are, at any given moment, certain about our philosophies. They may not be satisfying philosophies, ones that are wrecking our lives even, but it hardly seems that we can behave in any way that does not jibe one-hundred percent with our core beliefs. That they may not jibe with our purported or aspired to beliefs is another matter. Changing one's most deeply held beliefs, ones we've been forming since before emerging from the womb, is often a gargantuan task, one that is only possible in the context of philosophical investigation. The children of Woodland Park spend their days playing, and it's important that our playground be a world in which we are all free to engage in philosophical investigation. This is why we have long, hand-raising discussions on the subjects like the Easter Bunny or the Sugar Fairy. This is why we talk about the dead things we find or the animals we accidentally kill, which is the occasional fate of the worms in our compost or lady bugs in the garden. This is why we spend so much time talking about our rules, our agreements about how we as individuals will live together. This is why we wonder aloud about unanswerable questions, like "What is play?" I know that many of the readers here are folks who have very firmly held religious, political, and social beliefs. Those are our beliefs, ones we hold based upon our own philosophical investigations. But no matter what I believe, one thing I cannot do is tell you what to believe. I can share my own beliefs with you. I may be able to make you behave the way I want you to behave, but I'll never get another person to believe what I want them to believe, even if that person is a child. Our beliefs only arise from our own, uniquely conducted philosophical investigations. Studying philosophy cultivates doubt without helplessness, and confidence without hubris. I've watched kids evolve to be more rational, skeptical and open-minded, and I've seen them interact in more fair-minded and collaborative ways. As one 10-year-old said, "I've started to actually solve arguments and problems with philosophy. And it works better than violence or anything else." When Josephine and I got back to our friends, they joined us in our scrambles. As we re-rounded the corner, putting the rock formation between us and the rest of the world, the children began to discuss the Bowl of Soup theory. "If there were giants, we would see them." "Maybe they're so big that we fit between their atoms." "If they eat us, we would get digested, then pooped out." "Maybe that's where these rocks came from." "Maybe we're inside of poop right now!" It was a raucous, free-form conversation that bounce from the sublime to the ridiculous the way all the good conversations do. People tend to assume that adults, by virtue of our longer time on the planet, have an inside track on this sort of wisdom, but I'm here to tell you that this simply isn't true. I've found that we are all, always, equals when it comes to our philosophical investigations. In fact, one of the greatest truths of all was made clear to me in my own three-year-old's musings. We were in the car and she was griping about something. I lazily replied, "You know, Josephine, nothing is perfect." She rode in silence for sometime before saying, as much to herself as to me, "Nothing is perfect . . . except everything." It doesn't get deeper than that.